The following dialog appears after you have configured the settings available from the Save As dialog. Verify Normals- On export will verify all normals are facing the same direction, if one or more are flipped a Reverse Body Normals dialog will appear to correct any reversed normals. You can choose to output the STL in Binary or ASCII format. Digits of Precision - Controls the number of digits to the right of the decimal written for each coordinate in ASCII format output. A smaller value will result in a smaller output file. 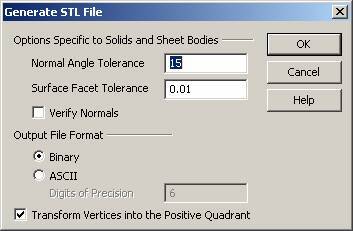 Transform Vertices Into the Positive Quadrant - This controls whether or not negative coordinate are acceptable in the output STL file. If your STL file will be used for stereo lithography, this check box should be checked. The file will then be created with the model shifted into positive coordinate space. However, some applications use the popular STL format for other purposes. If negative coordinates are acceptable in the application, you can disable this check box.